Looking for tasty lunch ideas? This eggplant panini with balsamic and sun-dried tomatoes makes for a perfectly healthy lunch that is also easy to prepare. Don’t have panini maker? No worries, you don’t need to spend $8 to $12 at a sandwich or even buy a panini maker as you can whip this up in a skillet grill pan or on a grill or skillet. I simply pressed the top of the sandwich with the bottom part of another clean pan and the bread was crispy in a flash. I used a good quality multigrain sandwich bread to get some extra fiber. The healthier breads often have the best flavor, often adding sweetness or in this case nutty flavors. 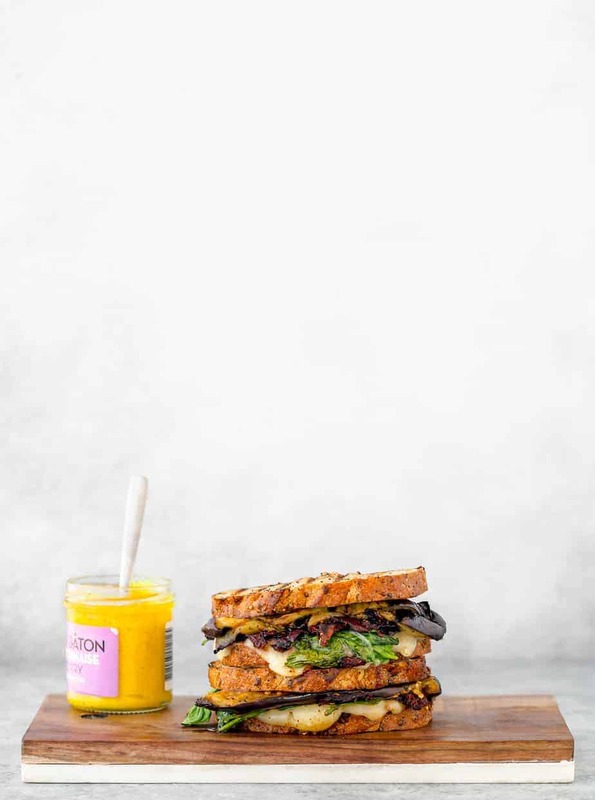 This eggplant panini contains provolone cheese, spinach, grilled eggplant (see recipe below), and cooked sun-dried tomatoes in balsamic vinegar. Eggplant and sun-dried tomatoes have flavors that compliment one another quite well in pasta dishes and sandwiches. Vegetarians will surely like this lunch but don’t hold back from making it for meat eaters as well. The eggplant can hold its own for flavor and consistency in place of a protein, much like it does in eggplant parmesan. Hope you’ll enjoy this easy lunch sandwich recipe of eggplant panini balsamic sun-dried tomatoes. My husband went crazy for it and my kids actually ate it up too. If you’re having guests over to watch some sports it’s quick to whip up ten or more of these sandwiches without that much extra effort, just be careful on your portions of salt, garlic and pepper. Combine the butter, garlic, salt, Italian seasoning and black pepper into a bowl and stir well. Brush eggplant with butter mixture and place on a grill. Cook over medium heat for about 4 minutes on each side or until tender. Set aside. Heat one tablespoon olive oil in a skillet over medium heat and cook garlic until fragrant. Add sun dried tomatoes, then cook for about 50 seconds. Add balsamic vinegar and white wine and keep cooking until the juice evaporates for about 1-2 minute. Turn off the heat and set aside. Slightly butter each side of sandwich loaf. Pre heat the grill pan over medium heat. Top each slice with provolone, spinach, grilled eggplant, balsamic sun-dried tomatoes and top with another slice of sandwich loaf, butter side up. Place a heavy skillet over the panini and press down, cooking for about 2 minutes on each side. Serve immediately. Eggplant and sun dried tomatoes are favorites of mine and I know I’d love this sandwich. I always like to switch up lunch and get some fresh ideas and this is one I know I’d enjoy. Looks so yummy! That panini sounds amazing. What an awesome option for a delicious summer lunch. I can’t wait to try it. That looks delicious! I love sun dried tomatoes. I’ll have to make one of these soon. I keep trying different recipes that roast eggplants, but they end up not being that tasty. I bet the sundried tomatoes really punch up the flavor. This looks really good! I’d probably take the tomatoes out of the list since I don’t like them, but everything else? Great! I have never tried using eggplant to make a sandwich with. Something new for me to give a try. I like the idea of eating lighter. This looks so good! This looks like restaurant style sandwiches that I’d find at an and coming deli. I love it! This sounds really good. I love eggplant, but haven’t had a recipe to cook with it in years. 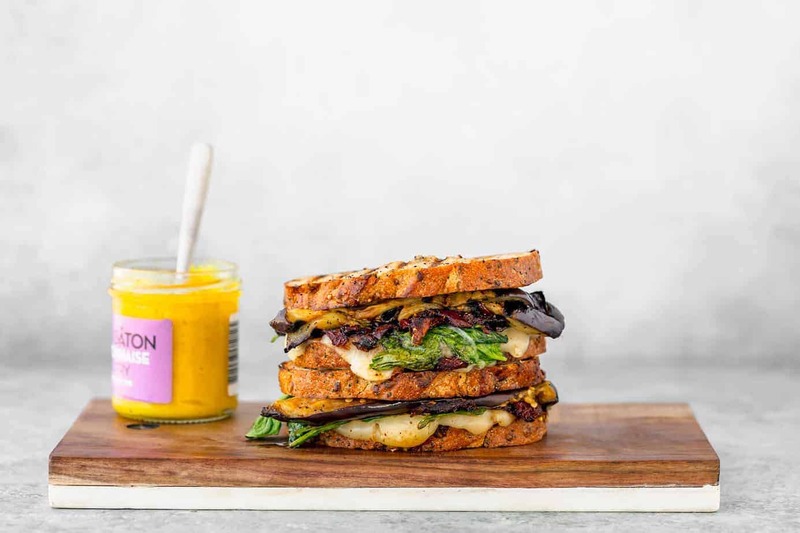 This looks like a really healthy sandwich I can take to work for lunch.It would be taste good and I love all the healthy ingredients you’ve used in the recipe. Grilled eggplant is one of my favorites. I am obsessed with paninis using sourdough bread. We are a family of vegetarians and I will have to give this recipe a try! That eggplant panini looks amazing. And I am not even that big of fan of eggplant. But I am a big fan of paninis for sure. 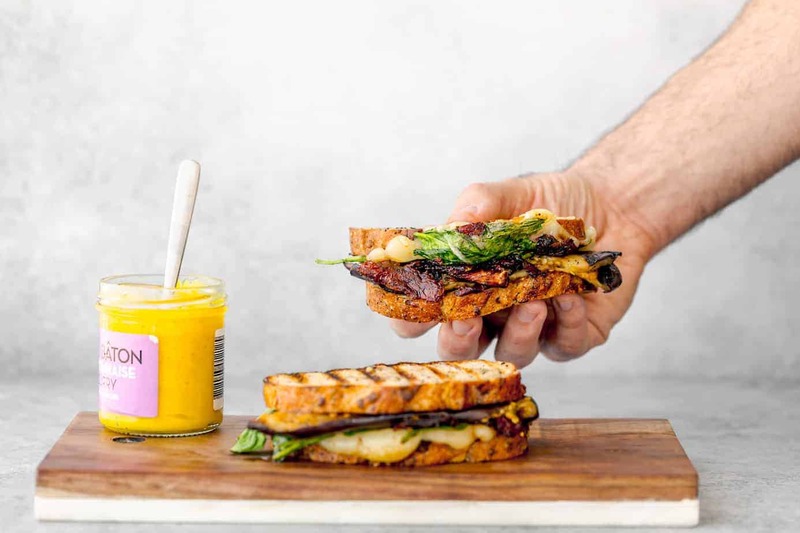 The eggplant panini sounds amazing with balsamic and sun-dried tomatoes I have never had anything like this before but it would indeed make for a great lunch idea my family. Thanks for sharing the recipe. This sounds SO tasty! Eggplant when it’s fresh is so good and makes a great veggie replacement for meat! This is one fancy sandwich! Never tried eggplant on a sandwich before, sounds yummy! I’ve never had an eggplant panini before! It looks tasty with that provolone cheese! I love eggplants on sandwiches and this just looks so good! !